This is even rarer than the related bristly ox-tongue (Picris echioides). The only permanent site seems to be along one short stretch of laneside hedgebank near Clogher in Co. Tyrone where it was first found in 1987 (still there in 2001). It has also been found, probably as a casual only, at Larne Harbour. 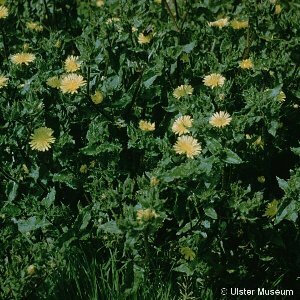 The plant is not native to Northern Ireland and how and when it became established at its Clogher site is a mystery. As its name suggests, this plant superficially resembles a hawkweed (Hieracium spp.). All names: Picris hieracioides L.; Picris spinulosa auct.